The Northumbria University Library’s goal was no different than that of many institutions: To find an approach to develop the ebook collection so it delivered excellent content coverage and usability for students and researchers, while being economic and financially sustainable. Their first instinct was to buy outright, though they quickly found that single-title acquisition proved slow to scale and packages rarely offered the optimum cost-benefit. The subscription option would be a better deal financially, but may not provide the comprehensive coverage of titles that students and researchers needed. “To put it simply, with most models, our desired content stretches beyond our budget. 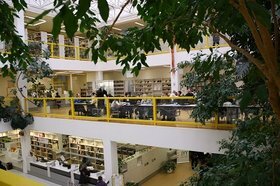 That’s not so with [demand-driven acquisition, or] DDA—we’re able to open up vast amounts of scholarly resources to students and researchers while only paying for what they use,” says Nick Woolley, Head of Library Services at Northumbria. He goes on to emphasize how providing user-friendly access to an extensive collection is key to maintaining student experience and supporting research, but many traditional models cost more than the flexibility they provide. As library collections have evolved to become more about access than ownership, alternative approaches were needed. The first solution that came to mind: a strategic mix of outright acquisition, subscription and DDA. Such a trilateral approach is becoming increasingly common, but achieving the right balance while delivering a seamless service to the end-user, and working within budget, is a difficult challenge to surmount. Furthermore, the full potential of DDA within such an approach is often difficult to realize because successful DDA programs quickly become too expensive to maintain at a comprehensive level.